Drowsy Driving. How Unsafe is Driving While Fatigued? 26 Oct Drowsy Driving. How Unsafe is Driving While Fatigued? Those monotonous drives on the I-10 do make a person tend to fade out or “drift off”, especially if it is a regular commute. Everyone experiences something like this on any road or highway. Often times we do not want to admit that we are “too tired to drive”. We all know that drinking and driving is dangerous and illegal. Most people don’t realize that drowsy driving is just as dangerous as driving drunk! After all, there’s no test for drowsiness, like the blood alcohol-level test (the breathalyzer) for drunk drivers. And it’s harder for a cop to spot a drowsy driver than one distracted by a smart phone. Nearly 3/4 of adults in America (71%) drive a car to and from work. According to a National Sleep Foundation (NSF) 2001 Sleep in America poll, many are drowsy drivers, . More than 1/4 of these respondents (27%) said they have driven drowsy to or from work at least a few days a month. 12 percent drove drowsy a few days a week. 4 percent said they drove drowsy every day or almost every day. Young people: More than half of fatigue-related accidents under 25 years of age. Night shift workers: often suffer from sleep deprivation, are much more likely to crash their cars – especially on their way home after a shift. People who suffer from sleep apnea: pauses in breathing that disrupt deep sleep, afflict one in three men and one in six women. The vast majority don’t know they have it. 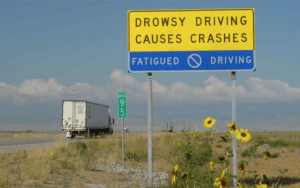 How Can We Reduce Drowsy Driving? Take a quick nap: 20-30 minutes can make a big difference in your energy and alertness. Have someone else drive you: or use public transportation as an alternative. Schedule your commute: try not to drive right when you wake up or very late at night. If you are chronically tired, have a sleep study to rule out sleep disorders. Get enough sleep: We can’t emphasize this enough. If you or a loved one was involved in a car accident for any of the reasons listed above or for any other reason, contact Louisiana car accident attorney. Our personal injury lawyers are committed to helping you achieve fair compensation for your claim. Contact us for a FREE consultation regardless of whether you use our services. The Law Offices of L. Clayton Burgess will work to get compensation for your injuries.